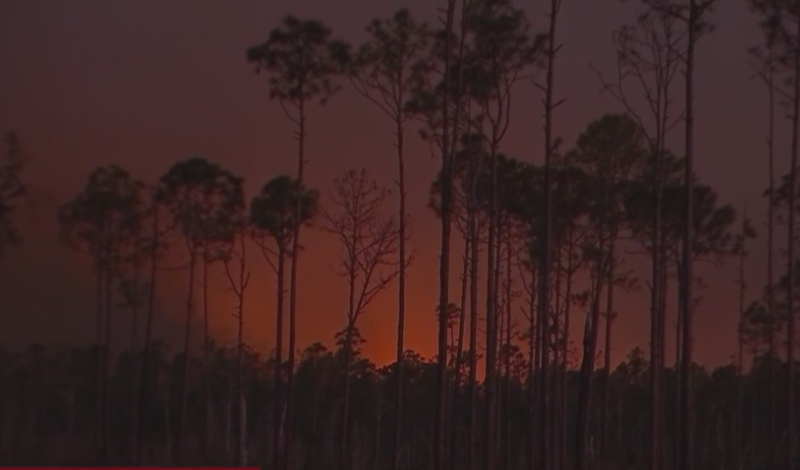 WINK News captured the glow from brush fires in Collier County. 3 large wildfires have burned over 18,000 acres so far. Fire crews worked to extinguish the Greenway fire Friday morning in the Picayune State Strand Forest, according to the Florida Forest Service. The fire caused by lightning scorched 17,138 and was 85 percent contained as of 11 a.m., fire officials said. The Greenway Fire showed little fire activity and if containment lines hold, fire officials should be able to increase containment this afternoon. A front is expected Saturday that will turn winds out of the North, fire officials said. Crews are preparing for potential lightning fires associated with the front. Prepare 30 feet of defensible space around your home. Clean dry and dead vegetation off the roof, out of the gutter, or from around the home. Prepare and practice an evacuation plan. For more information on wildfire prevention, click here. The West Boundary Fire caused by lightning in Hendry County has scorched 2,642 acres and was 90 percent contained as of 11 a.m. Friday, fire officials said. Collier County had a moderate fire danger level Friday, according to the Florida Forest Service. Lee County was listed as a high fire danger level.